This article is about the baseball player. For the former Australian politician, see Andrew McCutcheon. Andrew Stefan McCutchen (born October 10, 1986), nicknamed "Cutch" is an American professional baseball center fielder for the Pittsburgh Pirates of Major League Baseball (MLB). McCutchen was drafted by the Pirates in the first round (11th overall) of the 2005 MLB draft. He made his MLB debut in 2009. He has been selected for the All-Star Game the past five seasons (2011–15), and was the NL Most Valuable Player in 2013. McCutchen is under contract with the Pirates through the 2017 season, with a team option for 2018. McCutchen was born in Fort Meade, Florida to Lorenzo McCutchen and Petrina Swan. Andrew also has a sister. Young Andrew lived with his mother while his father attended Carson-Newman University in Jefferson City, Tennessee, where Lorenzo played running back on the football team. Lorenzo gave up his dream of making the NFL to be close to his son, and returned to Fort Meade in 1989. But Petrina would not marry him unless he became a church minister, which he did. The two married on August 1, 1992. McCutchen was eligible to play varsity baseball as an eighth grader at Fort Meade High School. He batted .591 that year. During McCutchen's varsity career, he batted .474, with his average for his senior season .709 with 16 home runs and 42 RBIs. He also played football and ran track. McCutchen was one of the top football recruits in the state of Florida but opted for a career in baseball. He was also a part of a state title-winning 4 × 100 m relay his freshman year of high school. 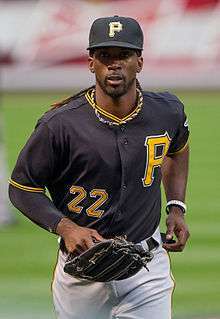 McCutchen, who had signed with the University of Florida, was drafted 11th overall by the Pittsburgh Pirates in the 2005 MLB draft and signed with the Pirates instead of going to Florida. He started for the South Atlantic League's All-Star team in 2006, his first full season as a professional player. At the end of that year, the Pirates named him the organization's Minor League Player of the Year. McCutchen was consistently considered a top prospect, being ranked a top 50 prospect in all four of his minor league seasons by Baseball America, peaking at number 13 before the 2007 season. On June 3, 2009, after the Pittsburgh Pirates traded starting center fielder Nate McLouth to the Atlanta Braves, McCutchen was called up to the major leagues for the first time. He made his debut the next day, playing the now vacant center field spot and batting leadoff against the New York Mets. He singled in his first career at-bat, off starter Mike Pelfrey. He ended the day with two singles, one RBI, three runs scored and a stolen base in four at bats. He recorded his first career four-hit game five days later, against McLouth and the Braves, in a 7–6 Pirates loss. Two of his hits were triples, making him the first Pirate with two triples in a game since Tike Redman accomplished the feat in 2003. On June 17, 2009, McCutchen hit his first career home run off of Francisco Liriano of the Minnesota Twins, a two-run shot in the third inning. He recorded a second hit as well, marking a hit in 11 of his first 13 major league games, with six of those games featuring multiple hits. On June 25, 2009, he had his first career walk-off hit, off Cleveland Indians closer Matt Herges. Teammates Jack Wilson and Eric Hinske both singled prior to McCutchen, who then hit a bloop single to left to score Wilson for the winning run. "He's an impressive looking young player. He really is", said Indians manager Eric Wedge. On August 1, 2009, against the Washington Nationals he went 4-for-5 with three home runs and six RBIs. He hit a solo home run in the first inning to lead off the game against Nationals starter Craig Stammen, a two-run shot in the fourth inning off reliever Tyler Clippard and then a three-run homer in the sixth off Logan Kensing. He fell a grand slam short of a (natural) home run cycle. He became the 10th Pirates player ever to hit three home runs in a single game, and the first one to do it during his rookie year. "It was just one of those days", said McCutchen. "It was one of those days where everything worked. I got my pitches, and I was able to hit them, I was able to hit them out. It's a day that I know I won't forget." . He hit his first walk-off home run on August 25, 2009, off Brad Lidge of the Philadelphia Phillies. McCutchen finished his rookie season with a .286 batting average, 12 home runs, 54 runs batted in, and 22 stolen bases in 108 games. He finished fourth in the voting for the National League Rookie of the Year Award. He was named the Baseball America Rookie of the Year for 2009 on October 16, 2009. McCutchen began the 2010 season as the Pirates' every day center fielder as a major hope for the team going forward, with praise coming from all over the league. "He's an All-Star. This year, probably", said Atlanta Braves manager Bobby Cox. "Hitting. Running. Defense. Throwing. He's got it all. He catches the ball like Andruw Jones did when he was 19. You can't hit a ball [past him] out there. He's got lightning in that bat too." He posted a career day against the Chicago Cubs on May 14, 2010, going 5-for-5 with five runs scored in a 10–7 Pirates win. Teammate Garrett Jones also recorded five hits, making McCutchen and Jones the first Pirate duo since Hall of Fame inductee Willie Stargell and Bob Robertson accomplished the feat in 1970. "I guess we were just kind of competing against each other", McCutchen said, laughing. "I don't know. I'd get a hit, he'd get a hit. He'd hit a homer, I'd hit a homer." McCutchen finished the month of May with career-best numbers, hitting .327 with a .901 OPS, which drew comparisons with Tampa Bay Rays All-Star Carl Crawford. McCutchen was not named to the 2010 Major League Baseball All-Star Team. Pirates pitcher Evan Meek was awarded the honor of being the Pirates representative, and stated that McCutchen was "very deserving" and should have gone as well. After hitting .226 in August, McCutchen batted .326 with 22 runs and 17 RBIs in September. He also recorded 12 multi-hit games from September 3 – October 3. McCutchen said about the changes from August to September, "Honestly, I don't think I'm doing anything any different right now. You swing, and the ball finds a hole. That's it. That's the game of baseball." He finished his second major league season hitting .286 once more while adding 94 runs, 16 home runs, 56 RBIs and 33 stolen bases. 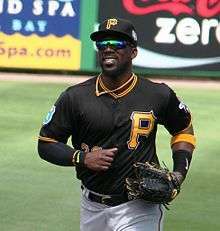 During the Saturday night game on July 9, 2011, it was announced that McCutchen would take the place of injured Ryan Braun as a member of the National League All-Star team at the 2011 Major League Baseball All-Star Game in Phoenix. The announcement was shown on the PNC Park scoreboard, and McCutchen left the dugout to tip his hat to the cheering fans. On August 30, 2011, McCutchen hit a ninth inning homer against the Houston Astros to become the eighth Pirates player to record at least 20 home runs and 20 stolen bases in one season. He was the first Pirate to accomplish the feat since Nate McLouth in 2008. After a disappointing month of September, McCutchen finished the season with a .259 batting average and team highs of 23 home runs, 23 stolen bases, 89 RBIs, and 87 runs. He was nominated as the Pirates' representative for the Hank Aaron Award. On March 5, 2012, McCutchen signed a 6-year, $51.5 million contract extension with the Pirates. The club has a $14.75 million option for 2018. On July 1, when the All-Star Game roster was announced, McCutchen and teammate Joel Hanrahan were named for the second time to the NL team roster. At the time of his selection, McCutchen was hitting .346 with 97 hits, 15 home runs, and 47 RBIs. McCutchen was chosen to replace Giancarlo Stanton in the Home Run Derby due to injury. He ultimately hit 4 home runs during the first round of the competition and failed to reach the second round. For his efforts in June, McCutchen was named NL Player of the Month, his first selection. In July, he won his first NL Player of the Week award and would later tab a second consecutive week, becoming the first Pirate since Jason Bay in 2006 to do so. During July he hit .446 with seven home runs and 15 RBIs and was named the NL Player of the Month for a second consecutive month. He became the first Pirate since Bobby Bonilla during the 1988 season to earn the monthly award twice in the same season. On September 29, 2012 McCutchen hit a walk-off solo home run off Jonathan Broxton of the Cincinnati Reds in the ninth inning for his 31st (and final) home run on the season. McCutchen finished the season with a .327 batting average, which was the second best in the NL, and led the NL with 194 hits. He recorded 20 stolen bases, marking the fourth consecutive season of 20 or more on the season. McCutchen finished third in the National League Most Valuable Player Award voting, behind San Francisco's Buster Posey and Milwaukee's Ryan Braun, but was voted the Player's Choice National League Outstanding Player. He won the Louisville Silver Slugger Award as the top offensive center fielder in baseball and also won his first Rawlings Gold Glove Award. On January 11, 2013, McCutchen was announced as the cover athlete to be featured on the cover of the baseball video game MLB 13: The Show. McCutchen gathered 108,147 votes in a week of fan voting via Twitter and Facebook, while New York Yankees' pitcher, CC Sabathia, came in second place with 89,054 votes. Though athletes cannot appear twice on the cover, he appeared on the back cover of the 2014 edition of the game. On April 3, 2013, McCutchen stole his 100th career stolen base in the second regular season game against the Chicago Cubs. On September 3, 2013, facing Milwaukee Brewers pitcher Yovani Gallardo, McCutchen hit his 100th career home run in the first inning of a 4–3 win. McCutchen was named to the 2013 NL All Star Team for the third straight year as a reserve. He finished the 2013 regular season with a .317 batting average, along with 21 home runs, 84 RBI, and 28 stolen bases, which marked the fifth straight year he achieved 20 or more stolen bases. His efforts helped lead Pittsburgh to a winning record and the postseason for the first time since Barry Bonds and the 1992 Pirates team. They were eliminated by the St. Louis Cardinals in the NLDS in game 5. After the season concluded, McCutchen won his second Silver Slugger Award, his second NL Most Outstanding Player Award, and on November 14, 2013, he won the National League MVP over St. Louis' Yadier Molina and Arizona's Paul Goldschmidt, the first Pirate since Bonds in 1992. Against the in-state rival Philadelphia Phillies on the 4th of July, McCutchen came close to hitting for the cycle by hitting 4 for 5 with two RBI's in an 8–2 victory, barely missing a home run in the 8th inning when it hit the right field wall of PNC Park a few feet short of clearing it. On September 10, McCutchen hit his first career Inside-the-Park homer against the Phillies. McCutchen was elected to the All Star game for the fourth time, making his first All-Star game start. In 2015, McCutchen won the Roberto Clemente Award. McCutchen was known for his long dreadlocks, which have spawned popularity days at PNC Park. Before the 2014 MLB season, he told the Pittsburgh Tribune-Review: "It's good to have an image. I have the hair, but eventually I'm gonna cut it". On March 25, 2015, McCutchen cut his dreadlocks, which will be sold through MLB's website via auction, with all proceeds benefiting Pirates Charities. McCutchen teased his fans on social media for a big "secret" before unveiling his new haircut. McCutchen proposed to his longtime girlfriend Maria Hanslovan on the December 11, 2013 episode of The Ellen DeGeneres Show. McCutchen, the son of a minister, is a Christian. He has spoken about his faith saying, "In my life, I want people to see that I'm not just a baseball player. I want them to know me as a Christian and as someone who is not afraid to make God's name known" and "I am thankful for every single day the Lord has given me and for what [Jesus] did for me when He died on the cross for my sins". 1 2 McCollough, J. Brady (March 31, 2013). "Center fielder Andrew McCutchen is now the face of the Pirates franchise". Pittsburgh Post-Gazette. Retrieved September 1, 2014. 1 2 DeMarco, Tony (2013). "Dreadlocks, Humility – and a Really Big Bat". NBC Sports. Retrieved September 1, 2014. ↑ "Andrew McCutchen Minor League Statistics & History". Baseball-Reference.com. Retrieved October 28, 2012. ↑ Klemish, Dawn (February 28, 2007). "The sky is the limit for Bucs' McCutchen". MLB.com. Retrieved August 19, 2012. ↑ Eagle, Ed (October 1, 2006). "Outfielder named Pirates Major League Player of the Year". MLB.com. Retrieved August 19, 2012. ↑ "McCutchen, Pirates sweep Mets, take advantage of Pelfrey". ESPN.Go.com. June 4, 2009. Retrieved August 19, 2012. ↑ "Ross' bases-loaded infield single plates winner for Braves in 15th inning". ESPN.Go.com. Associated Press. June 8, 2009. Retrieved August 19, 2012. ↑ "McCutchen hits bloop single to lift Pirates past Indians". ESPN.Go.com. Associated Press. June 25, 2009. Retrieved August 19, 2012. 1 2 Kovacevic, Dejan (August 2, 2009). "Three home runs mark history for Pirates' McCutchen". Pittsburgh Post-Gazette. Retrieved August 19, 2012. ↑ "Ohlendorf, McCutchen help Pirates end eight-game skid". ESPN.Go.com. Associated Press. August 11, 2009. Retrieved August 19, 2012. ↑ Gonzalez, Alden (November 16, 2009). "Coghlan named NL's top rookie". MLB.com. Retrieved August 19, 2012. ↑ Sheldon, Mark (October 26, 2009). "McCutchen is Baseball America's ROY". Pittsburgh.Pirates.MLB.com. Retrieved August 19, 2012. ↑ Crasnick, Jerry (April 9, 2010). "A reason to believe in Pittsburgh". ESPN.Go.com. Retrieved August 19, 2012. ↑ "HR, five hits each for McCutchen, Jones vs. Cubs". ESPN.Go.com. Associated Press. May 14, 2010. Retrieved August 19, 2012. ↑ Cameron, Dave (May 21, 2010). "The Next Carl Crawford". FanGraphs. Retrieved August 19, 2012. ↑ Jenifer Langosch (July 4, 2010). "Meek mighty enough to earn All-Star spot". pittsburgh.pirates.mlb.com. Retrieved August 23, 2013. ↑ Kovacevic, Dejan (March 29, 2012). "Pirates Notebook: McCutchen, on-base machine". Pittsburgh Post-Gazette. Retrieved August 19, 2012. ↑ Myers, Laura (July 10, 2011). "McCutchen selected to All-Star roster". MLB.com. Retrieved August 19, 2012. ↑ Dean, Richard (August 31, 2011). "McCutchen eighth Pirate to join 20/20 club". MLB.com. Retrieved August 19, 2012. ↑ Langosch, Jenifer (October 3, 2011). "Year of growth nets McCutchen Aaron nod". MLB.com. Retrieved August 19, 2012. ↑ Brink, Bill; Sanserino, Michael (March 5, 2012). "Pirates, McCutchen agree on new contract". Pittsburgh Post-Gazette. Retrieved August 19, 2012. ↑ Sanserino, Michael (July 1, 2012). "McCutchen, Hanrahan to represent Pirates in All-Star game". Pittsburgh Post-Gazette. Retrieved August 19, 2012. ↑ Singer, Tom (July 8, 2012). "McCutchen plans to have fun at Home Run Derby". MLB.com. Retrieved August 19, 2012. 1 2 Casella, Paul (July 9, 2012). "McCutchen wins NL weekly honors for first time". MLB.com. Retrieved August 19, 2012. ↑ Simon, Andrew (July 16, 2012). "McCutchen named NL Player of Week". MLB.com. Retrieved August 19, 2012. ↑ Casella, Paul (August 2, 2012). "McCutchen again named NL Player of the Month". MLB.com. Retrieved August 19, 2012. ↑ "Aaron McCutchen Statistics & History". Baseball-Reference.com. Retrieved October 28, 2012. ↑ Biertempfel, Rob (January 11, 2013). "McCutchen to grace cover of 'MLB13: The Show'". Pittsburgh Tribune-Review. 1 2 Cohn, Bob (February 22, 2014). "Cutch's Mass Appeal Continues to Grow". Pittsburgh Tribune-Review. Retrieved September 1, 2014. ↑ "Andrew McCutchen Statistics & History". Baseball-Reference.com. Retrieved November 14, 2013. ↑ Brink, Bill (July 6, 2014). "McCutchen to start All-Star game; Harrison, Watson selected". Pittsburgh Post-Gazette. Retrieved September 1, 2014. 1 2 Nesbitt, Stephen J. (October 30, 2015). "Pirates' Andrew McCutchen wins Roberto Clemente Award". Pittsburgh Post-Gazette. Retrieved October 30, 2015. ↑ "Sources: Andrew McCutchen agrees". ESPN. March 6, 2012. Retrieved September 1, 2014. ↑ "Pirates' McCutchen sheds locks to benefit charity". Pittsburgh Post-Gazette. March 25, 2015. Retrieved March 25, 2015. ↑ Sciullo, Maria (December 11, 2013). "McCutchen pops the question on 'Ellen'". Pittsburgh Post-Gazette. ↑ Meyer, Clay (May–June 2012). "All Star Center Fielder Andrew McCutchen Breaks Down FCA's 2012 Camp Theme". Sharing the Victory Magazine. Retrieved September 1, 2014. Wikimedia Commons has media related to Andrew McCutchen.